Description: This is an assortment of individually packaged Adventure figures that were sold to retail stores for resale. FPT1689 - X-Ray Man - Blue see-through man with blue hair. Individual model number is #381 X-Ray Man. FPT1690 - X-Ray Woman - Blue see-through woman with blue hair. Individual model number is #378 X-Ray Woman. FPT1691 - Clawtron - Black-bodied man with black helmet, robot claw-like silver hands and blue spots on his arms and legs. Individual number is #380 Clawtron. FPT3650 - Dune Buster - Man with a grey beard and moustache, green sunglasses, red long-sleeve shirt, blue pants, a tan cowboy hat, and brown boots. 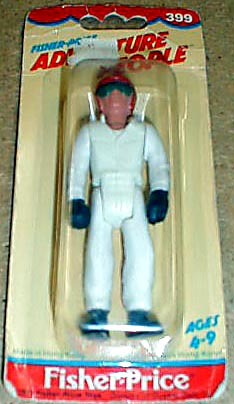 This figure is similar to the figure used in #322 Dune Buster, except for the shirt color. Astro Knight - Man wearing a blue (FPT1688) or yellow (FPT1687) flight suit, silver gloves and boots. These are the same figures that were used in #377 Astro Knight. His individual part number is #379 Astro Knight. FPT1214 - Frogman - Man wearing a blue divers suit with a blue hood and boots. He has a white octopus design on his chest and back. This is the same diver that was used in #323 Aero-Marine Search Team. His individual part number is #384 Frogman. FPT1692 - Space Commander - Man with white hair, bears, and moustache, Red long-sleeve shirt with gold accents, yellow turtleneck under shirt, red pants, and gold boots. His individual part number is #374 Space Commander. FPT1696 - Highway Trooper - Police officer wearing a blue and white helmet, silver goggles, a black long-sleeve jacket with a silver badge on his chest, light blue pants, and black boots. His individual part number is #373 Highway Trooper. FPT1676 - Supersonic Pilot - Wears a red and yellow helmet with a tinted visor, a blue vest over a white long-sleeve shirt (has a yellow and red circle within a white triangle on chest, and blue and yellow squares on his right shoulder sleeve), blue pants, black gloves, and black boots. Individual part number is #372 Supersonic Pilot. FPT1695 - Opticon - This figure is an orange robot with 2 "legs", quite non-descript. Individual part number is #371 Opticon. FPT8336 - Alpha Pilot - He is a spaceman wearing a blue-grey spacesuit. He wears a permanently attached helmet with a black face mask and black gloves. Individual part number is #389 Alpha Pilot. FPT1694 - Brainoid - Spaceman wearing a blue-grey spacesuit. His right arm is orange with a claw on the end, and he has a black glove on his left hand. He wears a permanently attached clear dome helmet with his orange jelly-looking "brain" head. Individual part number is #390 Brainoid. FPT1348 - Skydiver - Man wearing a white long-sleeve shirt and white pants. His shirt sleeves and sides of his pants have a blue stripe with white stars. He wears a red helment with blue-green goggles, black gloves and black boots. Also see #392 Adventure Figures Assortment. Each figure in this assortment was sold on a 6" long, 5-7/16" high, 1-3/16" deep blister card.